No.1-1-216, Suraram X Roads, Jeedimetla, Hyderabad - 500 055. 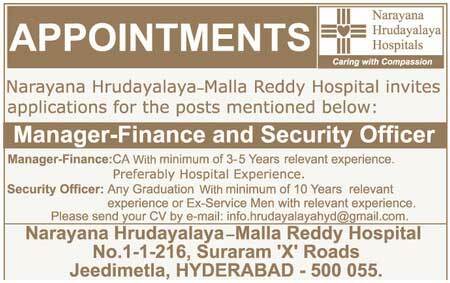 Manager-Finance: CA With minimum of 3-5 Years relevant experience. Preferably Hospital Experience. Security Officer: Any Graduation With minimum of 10 Years relevant experience or Ex-Service Men with relevant experience.